Belvedere Water Tower Revolving Restaurant, Wasserturm Belvedere, 5 Belvedereallee, Aachen. +49 241 1601 6281. On the Lousberg hill, Aachen, Germany. The water tower accommodates a revolving restaurant, which reopened in 2005 after being closed for several years. The restaurant revolves once every 56 minutes. 10am-6pm. La Vision, 11th floor, Hotel im Wasserturm, Kaygasse, Köln 50676. +49 221 2 0080. 35 km. Elegant restaurant atop the historical water tower. Fantastic view over Cologne. There is also a fabulous panoramic roof terrace. Tues to Sat 6.30pm-9.30pm. Turmrestaurant Revolving Restaurant, Florianturm, 2 Florianstrasse, Westfalen Park, Dortmund, North Rhine-Westphalia 44139. +49 231 138 4975. The tower was constructed similarly to a high concrete chimney. It consists of a reinforced concrete tube, which tapers off as it rises, reaching a height of 129.75 metres. At 137.54 metres there is a revolving restaurant. Buffet is at 5pm and you enjoy a great sunset view. Günnewig Rheinturm Revolving Restaurant (Rhine Tower), 20 Stromstrasse, Düsseldorf, Germany 40221. +49 211 863 2000. A 240 metre high concrete telecommunication tower in Düsseldorf, capital city of the federal state (Bundesland) of North Rhine-Westphalia. The revolving restaurant is at a height of 170 metres. Impressive. 20-Up Bar, Empire Riverside Hotel, 97 Bernhard-Nocht-Strasse, Hamburg 20359. +49 40 31 1190. 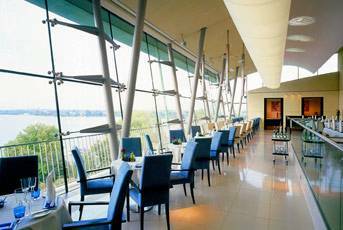 An unforgettable view of the river Elbe, the harbour and the city itself through seven-meter-high panorama windows 20 floors up. Skyline Bar. Waterkant, Empire Riverside Hotel, 97 Bernhard-Nocht-Strasse, Hamburg 20359. +49 40 31 1197 0480. Daily from 5.30 pm. to 11pm. Hotel Mecklenheide Restaurant and Bar, 6th floor, Hotel Mecklenheide, 262 Schulenburger Landstrasse, Hannover 30419. +49 511 74 0950. Guests enjoy their breakfast on the roof-deck with a great view over Hanover. TwentyOne, 21st floor, Kaiserslautern Town Hall, 1 Willy-Brandt Platz, Kaiserslautern 67655. 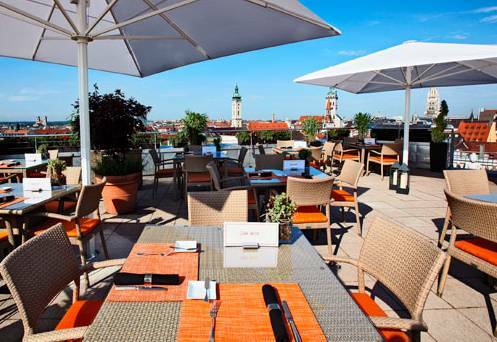 +49 631 320 4370 This restaurant and lounge offer an unmatched panoramic view of the city. Sun to Thurs 5.30pm-1am. Fri & Sat 5.30pm-2am. Panorama Tower, 9 Augustusplatz, Leipzig 04109. +49 34 1710 0590. 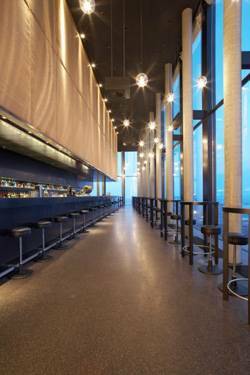 If you have grown tired of the usual dining experiences, check out the elegant bar/restaurant/lounge at Panorama Tower. 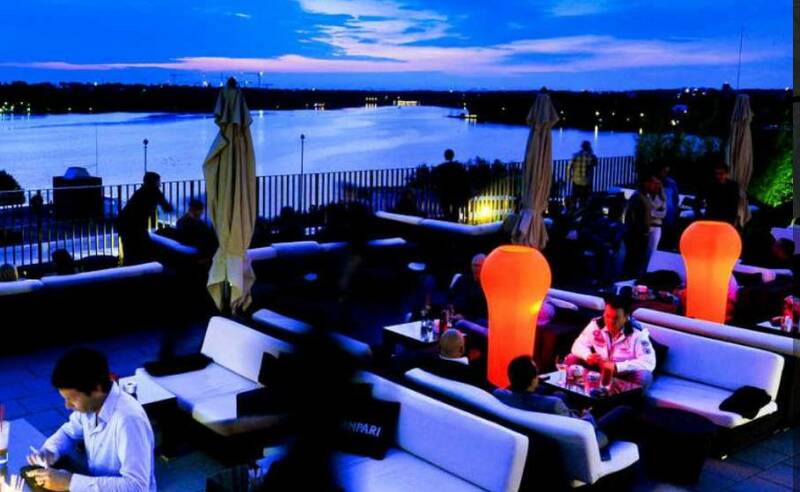 At 120 meters (nearly 400 feet) above Leipzig, this establishment offers some of the best vistas in the city, and stands as the highest eatery in all of central Germany. Sky High Dining. Skyline Revolving Restaurant, Fernmeldeturm, Mannheim. +49 621 41 9290. 204.8 meter high concrete telecommunication tower with an observation deck. A glassed observation deck and a revolving restaurant at a height of 120 meters allow a nice view over Mannheim and the surrounding area. 10am-12 midnight. Kitchen: 11.30am-2pm. 6pm-10pm. Buffet 11.30am-11.30pm. Luisen Park Revolving Restaurant, 12 Gartenschauweg, Mannheim 68165. +49 621 419 290 The park hosts the TV Tower which allows a 360 degrees view of Mannheim City and has this revolving restaurant. Here the guest has new perspectives on the city and Park and a comprehensive view. The restaurant rotates once per hour around the tower. The non-smoking restaurant offers 150 guests all year 10am-12 midnight. Each rotatrion takes one hour. The rotation times are from Monday to Saturday 12am to 2pm, 3pm to 5pm. and 6pm to 10pm. Sundays and holidays 12 noon to 10pm. The Starlight Bistro, 12 Gartenschauweg, Mannheim 68165. is also located at 121 meters above sea level but is only open for certain events. The elevator fees for adults: 4.50 EUR , 3.50 EUR for beneficiaries. Children under 7 are free. There are also special group rates. Café Vorhoelzer Forum, 21 Arcisstrasse, 80333 München, Germany. +49 174 974 8447 Directly on the roof of the Technical Univerity of Munich (TU München). There is a 270 ° panoramic view over the city's rooftops. Open year round. In summertime, in addition to the deck chairs on the roof terrace, you will find cushions there for your comfort. 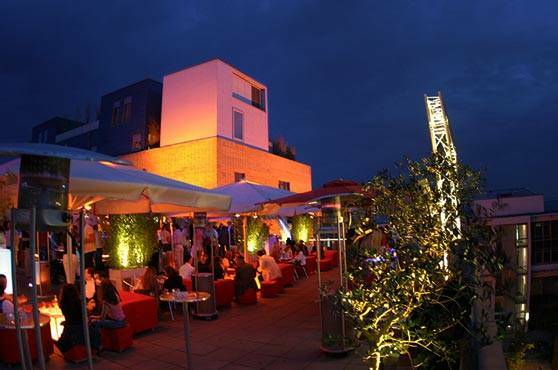 The Flushing Meadows Hotel & Bar, 32 Fraunhoferstrasse, Munich 80469. +49 89 5527 9170 (member of Design Hotels). 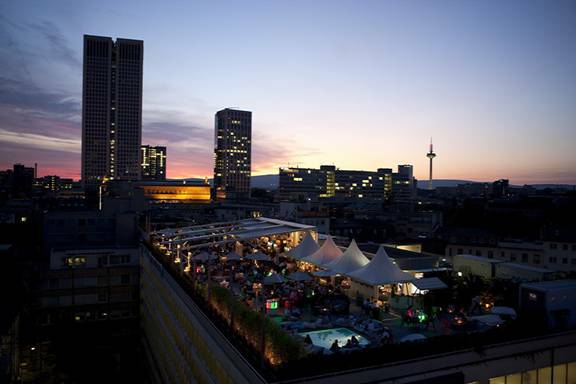 A new hip bar with an outdoor roof terrace on the top floor of a German Telecom office building. Quite tucked away and unpretentious. Almost like a speakeasy.